The fall projects continue and I am excited to be teaming up with some great bloggers for a monthly creative blog hop! This month it’s all about Fall DIY Projects where you’ll find tons of inspiration to keep you DIYing for months! 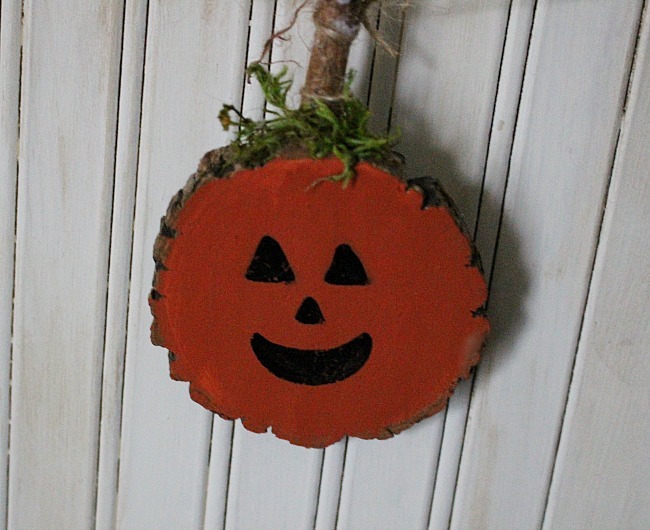 Today I am sharing a fun Fall Wood Slice Pumpkin Banner that is a perfect craft to make with the kids. You can paint the pumpkins white or orange. I went with a classic orange color. Then just have some fun with the faces. I looked up pumpkin faces on Pinterest just to have something to use as a guide. But you can make silly faces or scary faces. The sharpie paint pen makes it so easy! Also, if you painted these white you could turn them into ghosts with scary ghost faces and leave off the twig stem. That would be really cute too. I wanted to leave the banner up all Season, so I thought pumpkins would be able to stay up through Thanksgiving. Then just hot glue small twigs for the pumpkin stem to the top of each. Finally, attach it to the twine for hanging. 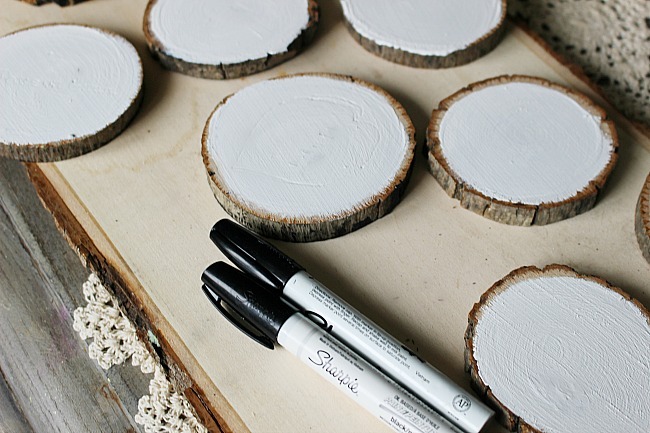 It’s a very simple, but cute fall project. Michelle these are so cute. I’ve been wanting to do something with wood slices for some time. We have some oak branches on the hill my husband cut down last year. I need to go get one to slice up and get crafty. Thank you for sharing your adorable pumpkin banner. I love their little faces. Pinned to my halloween board. It is impossible to look at your pumpkin banner without smiling! How cute…perfect for upcoming Halloween festivities. 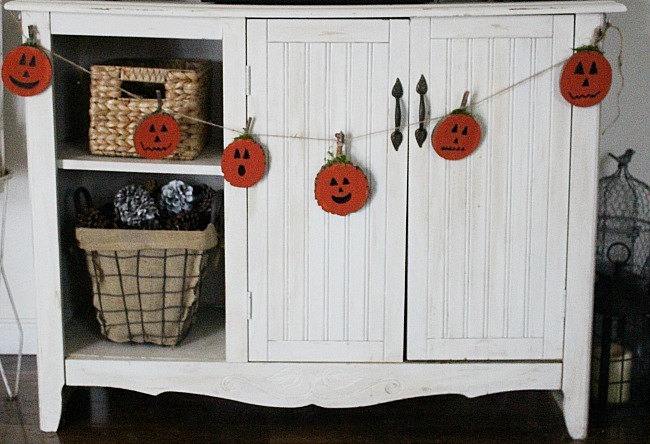 This has to be the cutes pumpkin garland!! Such a great idea!! Super cute project and your pumpkins expressions are perfect and adorable! Love your fall garland. Oh my Michelle this little banner is beyond adorable. I love how they each have their own expression. Very, very cute. Pinning. So cute! And I love that they all have their own expression! Oh, how adorable this is! I love wood projects so much and this banner is simply the perfect DIY project for the Fall. Very nice! I’m not a diy expert but it seems very easy to do! These are so cute. What fun you must have had fun creating them.